This potato bread is also fabulous for breakfast served warm and topped with some crispy bacon. 2. Toss the flour, baking soda and salt in a bowl with the potato pieces and roughly chopped herbs. Whisk the eggs in a cup. 3. Make a well in the centre of the potato mix. Pour all of the eggs and most of the buttermilk into the flour mix. Using a large spoon, gently and quickly stir the liquid into the flour. Add the rest of the buttermilk if the dough looks too floury. 4. Once the dough starts to come together, use floured hands to gather it in the centre of the bowl. It should be quite soft but not sticky. Pat the dough into a round with floured hands. Cut a cross on top of the dough with a wet knife. 5. Place on a floured baking tray and bake for 45 minutes, until the loaf sounds hollow when tapped on the bottom. Place on a wire rack to cool. 6. Meanwhile, mix together all the dressing ingredients in a bowl and chill in the fridge for 1 hour. 7. 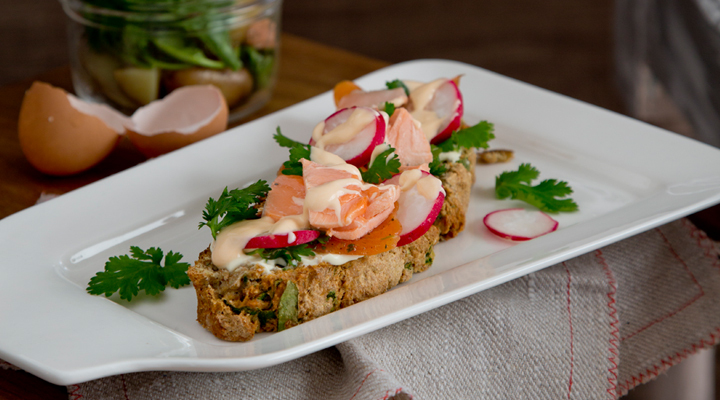 Slice the loaf and top with salmon or other leftover seafood, sliced radishes and salad leaves or fresh parsley. Drizzle over the dressing and serve.